On June 12th Steven Webster of Soulforce Wisconsin received in the mail an anonymous statement over the name Wisconsins Confessing Movement, however the name Wisconsins Confessing Movement neither identifies any organization as Wisconsin Association of Confessing United Methodists (WACUM) would, nor does it identify any individual, officer or committee of WACUM or any other organization. This anonymous statement also appears to be addressed to no one in particular. What follows is Soulforce Wisconsins response to the anonymous statement. The anonymous statement makes a claim which is not true. Soulforce Wisconsin has pulled out of no dialogue with WACUM or any other party. 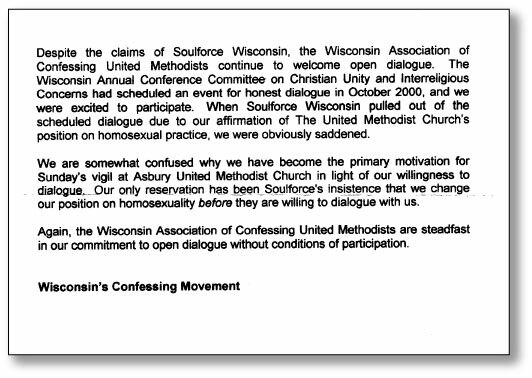 It was only after the cancellation of the early October 2002 dialogue by the decision of the Conference Commission on Christian Unity and Interreligious Concerns (CCUIC) that Soulforce Wisconsin and a representative of WACUM were first brought to the same table (in the Bishops office in late October 2002.) The late October 2002 meeting was a cordial one in which Soulforce Wisconsin submitted a proposal for negotiations with WACUM that was refused by WACUMs representative with little explanation. At no time was Soulforce Wisconsin a party to CCUICs dialogue, and, in fact, CCUICs decision to cancel that early October 2002 dialogue was due (according to CCUIC) to the withdrawal of a party unrelated to Soulforce Wisconsin. Subsequent to the late October meeting in the Bishops office, Steven Webster of Soulforce Wisconsin wrote a letter to the same representative of WACUM seeking an explanation of his prior refusal of our proposal to negotiate. In a written reply dated February 26, 2003, the WACUM representative gave reasons why WACUM could not agree to our proposal, and further indicated that dialogue would produce no change in WACUMs position. What does WACUM mean by open dialogue or honest dialogue if they understand it as an exercise in which they are exempt from considering any changes to their own position? It should be noted that Soulforce Wisconsin has consistently framed our request in terms of negotiation, and we recognize that this involves compromise. We are seeking some compromise that will allow some United Methodists, at least, to fully acknowledge the full human dignity of LGBT persons and the equality of all persons in Creators eyes without threat of charges for violating church law. Is it too hard to envision a church which embraces both WACUM and LGBT Christians and their allies, or must it always be that WACUMs viewpoint exclusively is the law and teaching of the Church? Over the past several weeks, beginning prior to Soulforce Wisconsins vigil in Wausau on May 21, 2003, Steven Webster has sent two letters to the President of WACUM and has to date received no reply (not counting the anonymous statement received June 12). The refusal to answer Soulforce Wisconsins letters belies any interest on WACUMs part in real dialogue. In both those letters Soulforce Wisconsin expressed openness to some third way (other than the current positions of either Soulforce Wisconsin or WACUM) that might move us towards reconciliation. It is a principle with us that neither we nor our adversaries have a total monopoly on the truth and that openness in dialogue or negotiation must include an openness by both parties to consider some third alternative which may move all parties towards a better understanding of the truth. Soulforce Wisconsin also insists that dialogue and negotiation imply a mutual recognition of the basic human dignity and equality of all parties to the dialogue or negotiation. Our understanding of the statement on Real Dialogue by Mel White is simply that--presumptions that LGBT are morally, physically, psychologically, socially and legally inferior to heterosexual persons (presumptions held by WACUM according to a letter from a member of their executive committee dated February 26, 2003) make real participation by LGBT persons in honest dialogue and negotiation impossible. If LGBT persons would enter such a dialogue as presumed inferiors, they would come out of such dialogue as inferiors. We are Gods Children too!